Last Thursday, Michael Casey joined the UW Real Estate program for a lunchtime Q&A session and a Real Estate Club meeting. Mr. Casey is originally from Milwaukee and earned his BBA and MBA from the University of Wisconsin-Madison. He was honored with WREAA’s Distinguished Real Estate Alumni Award in 2016. The award recognizes the commitment and dedication of a University of Wisconsin-Madison real estate alumnus, which can be seen through his continued involvement and support of the UW Real Estate Program and the Wisconsin Real Estate Alumni Association. His career began with 25-30 years focused on acquisitions and then transitioned to raising capital. 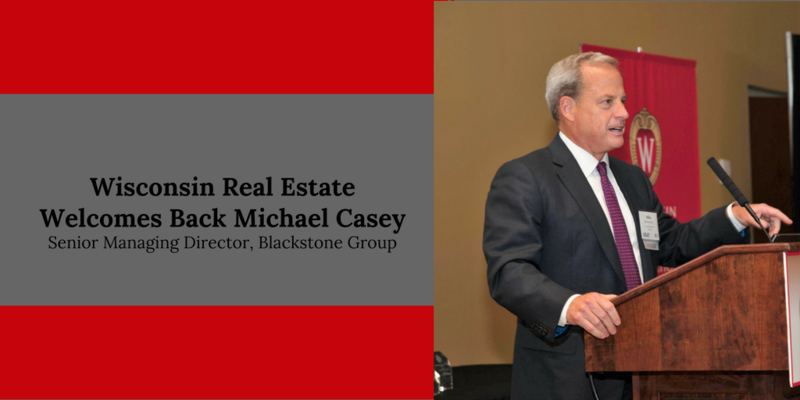 Mr. Casey credits his experience in transactions with helping him to have an in-depth knowledge of real estate, which he believes has been integral in his success raising capital. In addition to being knowledgeable, he told students that to raise money people need to be able to trust you, and this comes from never taking shortcuts or compromising your integrity. Mr. Casey also spoke on topics such as how an investment committee at a large firm like Blackstone Group operates and global trends in capital availability. WREAA thanks Michael Casey for spending this time with student Real Estate Badgers!